We’re going to talk about math and relate some numbers to the health of your business. OK FREEZE. DO NOT CLOSE THIS POST AND MOVE ON TO THE NEXT ARTICLE …I know that this may be intimidating for some, but I promise to make it painless. Stick with me while I lay out a few key metrics that should roll off your tongue as quickly as your Deadlift PR. SESSIONS PER MONTH/WEEK: How many sessions to do need monthly to hit your financial goals? MONTH - Most of us pay bills monthly. Performing a certain number of sessions per month insures that you’re covering your bills and making a profit. NEW LEADS - Are you keeping track of how many potential clients you come in contact with and where they come from? LEADS TO TRIAL OFFER - Of those potential clients, how many actually take you up on a sample session or free consult? CLOSING RATE (TRY TO BUY) - How many purchase a package and start to train with you? QUARTERLY REVENUE - Check your profits or losses each business quarter. The nature of the training business cycle lends to different goals throughout the year. Checking in quarterly will allow you to evaluate what worked or didn’t in the last three months, plan for the months ahead and set realistic goals based on the business cycle. Still with me? Awesome! Let’s dive in a little deeper. Here’s where we talk goals and targets. The first number we need is a personal one, but it’s probably the most important. How much money are you spending each month? You need to be sure you’re bringing in more cash than what’s going out. Don’t forget to set aside some cash for paying taxes and to factor in a contribution to your savings account and/or retirement fund. Once you figure out how much you need/like to make each month, you divide that by your session rate to figure out how many sessions you need to perform. Let’s look at a quick example. Let’s say your financial target was $3,500 for the month. Factoring in taxes at 40%*, you would need to make about $1,225 per week. If you charge $110 per session, then you would need to do a minimum of 45 sessions per month, or 11-12 sessions per week to come up with the funds. 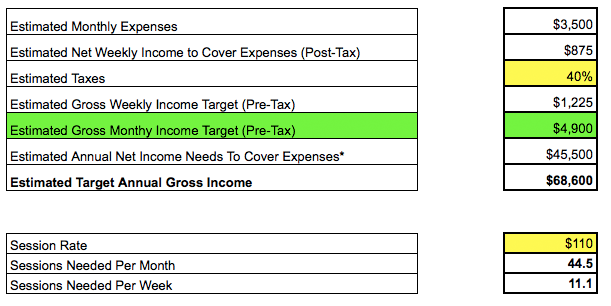 Click HERE to download my Monthly Expense Planning Sheet with built in formulas. *It’s best if you consult an accountant to get a guestimate on how much you should be saving for taxes. In my experience, it’s always better to aim high and save more than Uncle Sam asks for! Hopefully you’re hitting that last metric out of the park and you are already doing more sessions than you need. If not, then it’s time to find a client or two. Where do you start? If you’ve kept track of some of your marketing stats, you’ll know exactly where to begin. If not, then there’s no time like the present to start keeping track! Start casting your net. Pick 3-5 lead generators to focus on. 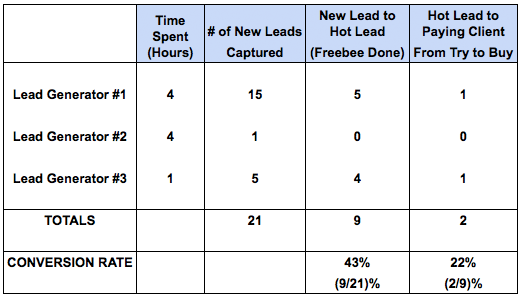 Keep tally of how many leads you get from each and how much time you spent executing (as shown in the example at the end of the article). Note which gives you the most bang for your buck in quantity AND quality. Keep what works and ditch what wastes your time. Turn those leads to clients! Of those new leads you generated, how many sign up for a free consultation or assessment appointment? We’ll call them “hot leads.” That’s the first number that’s important to us - Part One. 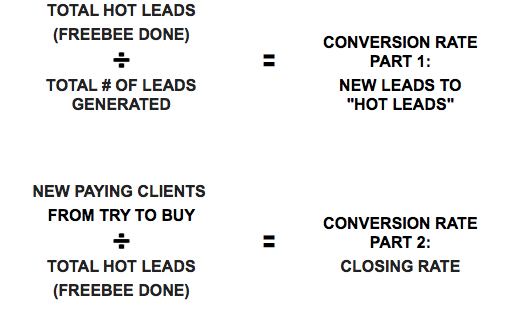 As for Part Two, your closing rate, how many hot leads turn into paying clients who start a training program? 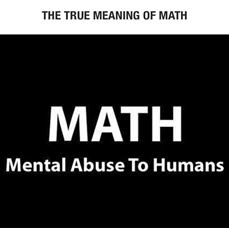 You made it through the math, but why did I put you through that torture? Mind you, I have a degree in Applied Math and Statistics and even I think crunching numbers is a bore. One thing my degree taught me is that data is meaningless unless you analyze it and learn something. As I wrote in my original post for PTontheNet, having an open mind here is key. I know sometimes ignorance is bliss and it’s scary to reflect. You may be feeling the same way a scale-phobic client does on reassessment day, but do it anyway. You need to use these metrics to figure out where you're succeeding and where you’re falling short. If you find that your marketing methods aren’t generating enough leads, then reevaluate that process and try something new. Are you converting those leads to potential clients who take you up on complimentary sample services? No? Then something's missing from your offer or you're doing something to scare them off before you build rapport. Maybe you're enticing plenty of people when it's free, but no one is actually buying? Then you may not be conveying value or focusing enough on your sales process. Are you practicing your complimentary session and rehearsing your professional recommendations? You should be if the numbers indicate that’s where you need work! This is all a numbers game. The more leads you generate, the more clients you’ll have no matter what your conversion rates are. A 35-40% conversion rate from lead to paying client is considered average. That means that more than half of the new leads you generate may not materialize into actual clients… AND THAT’S OK - especially if you’re just starting out. Don’t be afraid to check out the stats. You’re going to get rejected. Not every client is the right match for your service. However, don’t use that as an excuse to keep your same old tired process that isn’t working. ALWAYS try to improve and fine tune your approach. Just like cleaning up a sloppy diet, don’t try to improve every step of the process all at once. Pick one area and make that you’re main focus. Checking in quarterly is a perfect way to keep on track. Schedule time in your calendar to review and plan, because otherwise, it won’t get done as you already read in my last post. HOW ABOUT AN EXAMPLE - What’s an article about math without a sample problem? Each month you keep track of your leads and conversion rates, as shown below. Here is last month’s stats. Analyze. Would you keep lead generator #2? Why or why not? Seems like lead generator #1 gave you QUANTITY and lead generator #3 gave you QUALITY. Agree or disagree? Would you keep both in play next month? If you were looking to improve your process, where would you start? Let’s discuss - include your answer in the comments below or feel free to contact me directly! Jessica Botte has a unique perspective on the fitness industry. In the last 10 years she has transformed from an overweight desk jockey to a top ranked fitness professional and entrepreneur. In 2011 she quit her corporate job in construction management to pursue a career in fitness as a NASM certified personal trainer and group fitness instructor. After a year of independent training, she began working at an Equinox on Manhattan's Upper East Side. She quickly became one of the most sought after trainers at the club and a mentor to her colleges. Her professionalism and past experiences made Jess a great candidate for her current role as Fitness Manager. Jessica has been "training trainers" in that position since 2015. Most recently, Jess has branched out into public speaking and developed her own Corporate Wellness Program, JBeWell. Her goal is to use all these channels to help as many people as possible create lasting change in their lives. Jessica received her BS in Applied Mathematics and Statistics from Stony Brook University, holds a Behavior Change Specialist certification from NASM and is Precision Nutrition Level 1 Graduate.